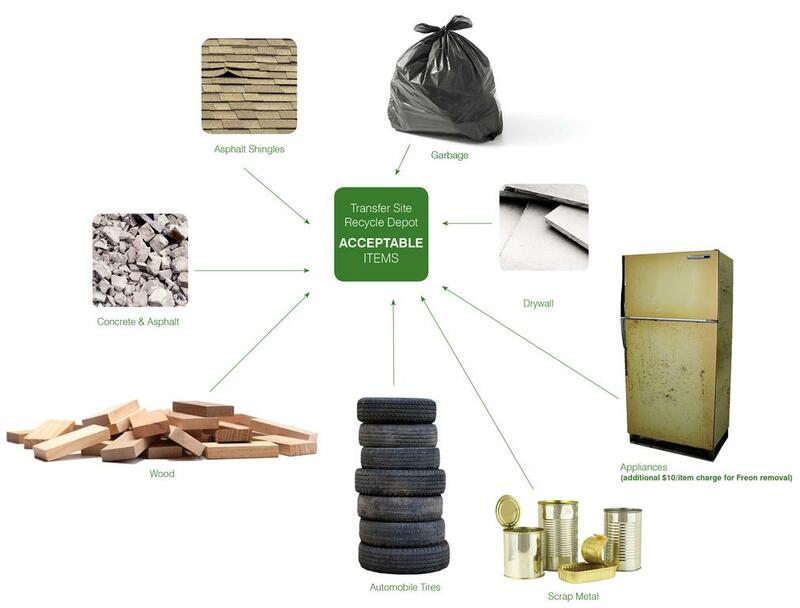 CURRENTLY THE AIRDRIE TRANSFER SITE IS NOT ACCEPTING ASPHALT OR CONCRETE FOR PROCESSING. When visiting the Transfer Site, please arrive with sufficient time to unload all material prior to closing. The transfer site is a collection point for residential waste and construction material. Waste is transferred to landfill sites in Calgary. Sorting materials into the groups noted on this page helps us to recycle. City of Airdrie recycling facilities (including the Airdrie Transfer Site) are subsidized through an environmental fee paid by Airdrie and Rocky View residents (additional fees apply at the Transfer Site). Business use of our facilities is not permitted as they do not contribute to this funding. *Please take household hazardous waste, paint, and microwaves to the Recycle Depot. **Secure load means "a truck load of residential household waste and incinerator material contained by either a tarp, net, straps, or similar device in such a manner that the residential household waste and incinerator material is not released from the truck during travel." While travelling within Rocky View County their bylaw states, "every person who transports Litter on a highway by any means, including but not limited to transportation in or on a Motor Vehicle, Trailer or other device, shall ensure that the Litter is adequately contained, secured or covered to prevent it from falling off or being blown off while being transported." Fines range from $500 to $10,000 and imprisonment. 7km west on Highway 567, next to the rodeo grounds. Alberta Waste and Recycling Ltd. 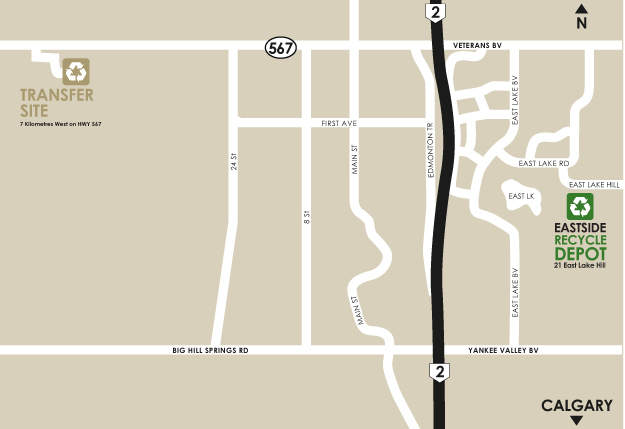 Seven km west on Highway 567, next to the rodeo grounds.